A perfect pair for time outside. Stay warm and dry at camp (or your keep pup happy!) with our lightweight Field Blanket and Bandana. 40D ripstop exterior is made from the same durable, resilient fabric of our Roo Single hammock. It blocks wind and water, while staying soft and snug, meaning it can handle whatever you throw its way. Cozy microfleece is lighter than the Mountain Blanket, with DWR protection to protect against water and dirt. Forgot a pillow? No worries. 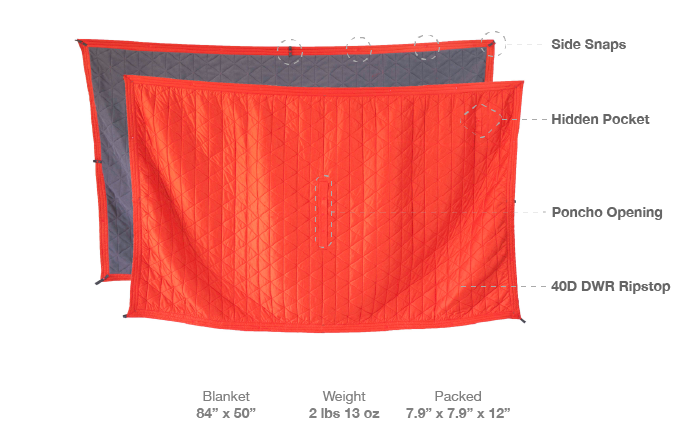 Simply flip the stuff sack inside out, pack it, and rest on the microfleece-lined interior. Stylish and functional, it's the best of both worlds! Keep warm and dry while keeping your hands free. Snaps line the edge of the blanket, allowing it to take on multiple modes, as well as modularity with the other All-Adventure Blankets. 7.9" × 7.9" × 12"
How do I wash my Field Blanket?